The women’s 800 freestyle was a tremendous race between Chloe Sutton and Andreina Pinto of Venezuela. At the 400 meter mark Sutton had a slight lead over Pinto turning in a time of 4:14.36. Sutton continued to hold that lead going into the last 100 when Pinto made her move taking the lead at the 750 meter mark, but the unrelenting Sutton stayed with her and eventually got her hand on the wall five one-hundreths of a second ahead of Pinto winning the event in a time of 8:25.88 followed by Pinto who posted a 8:25.93. The two women are now ranked eighth and ninth in the world. Kristel Kobrich finished third in a time of 8:31.77. In the men’s 100 freestyle, a race that featured five Olympic gold medalists, Anthony Ervin used his speed to take an early and substantial lead turning at the half way point in a time of 22.93. Ervin hung on to win the event in a time of 49.14. Ricky Berens finished second in a time of 49.99 followed by Michael Klueh who finished third posting a time of 50.35. 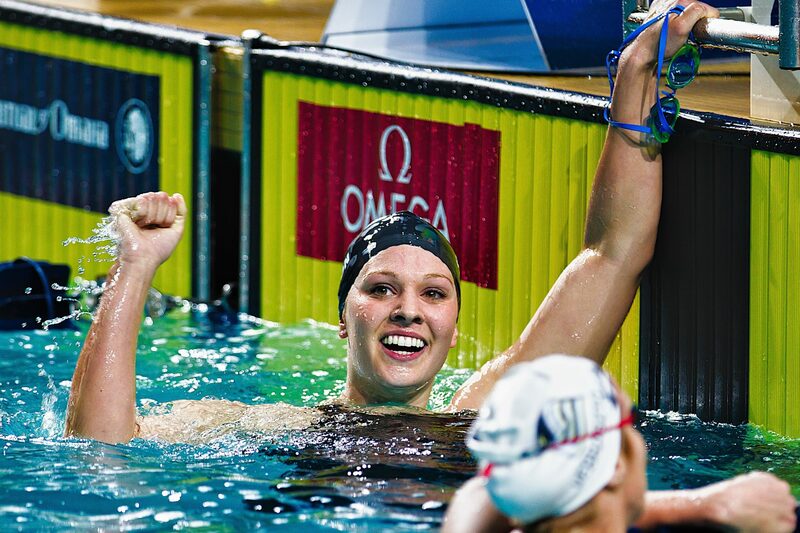 Home town girl Kathleen Baker had an incredible race in the 200 IM, posting a lifetime best by two seconds to win the event in a time of 2:14.46. Baker lead for most of the race, but had to hold off both Annie Zhu and Brooke Zeiger, who both had great breaststroke and freestyle legs in the race. In the end Zhu finished second recording a time of 2:15.00 with Zeiger finishing third in a time of 2:15.40. Chase Kalisz had a dominating win in the 400 IM on the second night of the competition, taking the event in a time of 4:15.66. On the final night of the Charlotte Grand Prix Kalisz had to get by Ryan Lochte to win the 200 IM and he did just that in the breaststroke, going on to win the event in a time of 1:59.66. Joseph Schooling, who won both the 100 and 200 butterfly events, also overtook Lochte, who lead at the 100 meter mark, for second touching in a time of 2:00.77 with Lochte finishing third in a time of 2:01.56. If you thought that Kathleen Baker was impressive improving by two second to win the 200 IM, in the very next event 15 year old Kaitlin Harty out did Baker cutting four seconds off her best 200 backstroke time to win the event in a time of 2:10.83. Megan Romano, who is having a very good meet in her own right, finished second in a time of 2:11.27 with Brooke Zeiger finished third in a time of 2:11.59. In the men’s 200 backstroke Ryan Murphy separated himself from the field in the final 50 meters to eventually taking the event in a time of 1:59.93. Jack Conger finished second posting a time of 2:00.25 with Ryan Lochte finishing third recording a time of 2:00.80. 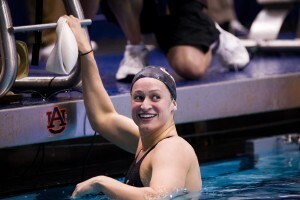 Shannon Vreeland finished second in a time of 55.39 with Lia Neal finishing third in a time of 55.57. Connor Jaeger collected his third win of the meet by winning the men’s 1500 freestyle in a time of 15:02.68. It was not easy as Michael McBroom pushed him through the entire race eventually finishing second posting a time of 15:03.38. Matias Koski finished third in a time of 15:20.22. I love watching Sutton. She is a racer, no doubt about it. Reading about her clinics and how much she loves the water is inspirational. You can see it in her face. She lights up like no one else. We sure loves the water. Water. Water. That time by Andreina Pinto is faster than she swam last year to become the only South American female swimmer to make an Olympic final. Adreina Pinto is a NEW SOUTH AMERICAN record, beating her time last year of 8.26.43 in London.